I went to the “I Should Be Writing” Retreat last week: three days and two nights at gorgeous Loon Lake in Maple Ridge, BC. It’s secluded and quiet as it’s located in the middle of a research forest owned by one of the local unis. Loon Lake is near-ish the top of what the rest of the world calls a “mountain” and what people in BC call “a hill” (It’s only “a mountain” if you’ve never seen the Coastal or Rocky Mountains). Regardless of what you call it, it’s above the snow line, so there were still some patches of snow on the ground. There were a few moments of decidedly chunky rain as well. Before I could work up a nice foamy head of oppositional defiance, I remembered that I actually loathe swimming in lakes. I am not really “a nature person.” Probably because everything in nature is trying to kill me. (I wrote a poem about that a few months ago). The chalets where we slept and the communal dining hall were comfortable, with all mod cons. Food was good, too. Somehow I neglected to bring towels, but the lodge staff were very kind and hooked me up with a towel and washcloth. I’m sure my chalet-mates were very grateful I wasn’t a disgusting stinky beast the whole time. I didn’t get any “writing” done, but I’m not in “writing” mode (which is to say “drafting chapters”). I’m in “story generation” mode, with the colour-coded index cards, notebook, and fifty-seven open browser tabs reading up on the Plague of Justinian in 541 CE and the cultural beliefs of the Coast Salish peoples. Believe it or not, in the sequel to Blood Rain (working title: Blood Down the Bones) both of those things are germane. Your mileage may vary, but I need a ten-scene outline on index cards and some character mood boards before I can get any drafting done. I spoke with someone on Sunday about certain ideas I have for the next book, and she said, “That’s gross and creepy. Perfect!” I was so pleased! 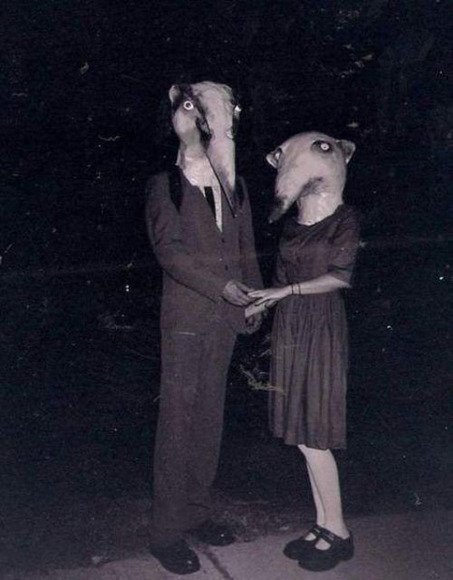 In honour of Hallowe’en, some very creative and fairly creepy vintage costumes. I have three days off in the middle of the week! Bad for the pocketbook, but good for Blood Rain. I can see the end of this forever-first draft. My focus on that plus some changes in family life (that I may or may not write about, I haven’t decided yet) mean I’m taking the week off. DWSG will return next Monday, July 13 2015.